The Village of East Hills, New York, was incorporated on June 24, 1931, and held its first election on July 8th that same year. But even before it was incorporated, East Hills has been a part of the recorded history of the United States since 1643. In that year, the Rev. Robert Fordham and John Carman sailed across Long Island Sound from Stamford, Connecticut and purchased what we now know as the townships of Hempstead and North Hempstead from the Rockoway, Mericock, Marsappeaque and Matinecock Indians. Settlers came the following year and named the area Hempstead, in honor of their home city, Hemel-Hempstead in Great Britain. The area fell in relative obscurity for about a century after that. East Hills cannot boast that George Washington ever slept here, but his diary does refer to an Oyster Bay visit, and of his breakfast at what we now know as the George Washington Manor on Old Northern Boulevard in Roslyn. We also know that President Washington inspected the paper mill in Roslyn park, and it certainly doesn’t take much imagination to have the Father of Our Country riding, or walking, the 100 yards to what was to become East Hills. Perhaps the one thing in East Hills which has been in existence longer than any other man-made object is Harbor Hill Road in East Hills. “A path alongside Harboure Hill” is mentioned in records dating back to 1661. For many years, much of what now is East Hills was the home of a few wealthy families. The neighborhood now known as Fairfield Park was once a polo field. The Country Estates neighborhood was the home of the Clarence Mackay family for 30 years, starting in 1898. The Prince of Wales, who later abdicated the throne of the England to marry Mrs. Simpson, was entertained at the Mackay estate in 1924. And Charles A. Lindberg rested at the Mackay estate after his return to the United States following his historic solo flight to France in 1927. On June 24, 1931, representatives of the 269 people living in the village-to-be met in the home of Robert H. Willets, whose family lived in the area for eight generations. The Willets family then lived in the house where Stephen Taber, one of the great names in Roslyn’s early history, resided in 1839. The house still stands at 50 Andover Road, off the Long Island Expressway’s South Service Road near the entrance to the Norgate neighborhood. 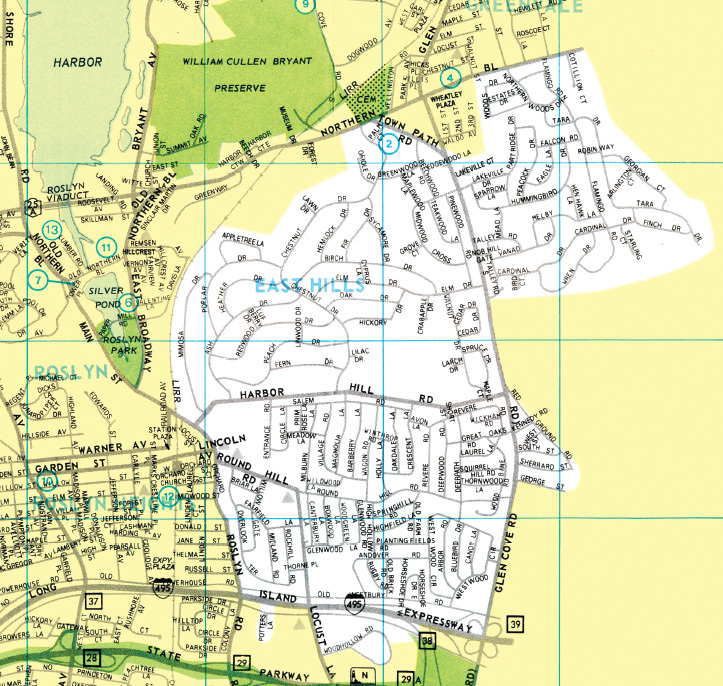 The name “East Hills” was adopted at the suggestion of H. Stewart McKnight, who was then the Nassau County Attorney. Two weeks after the incorporation, an election was held in barns on the Mackay estate, and Mr. Willets was elected Mayor. John Mackay, Ellen A. Hennessy, Stephen Willets and Catherine Hechler were elected Trustees. Charles Hechler, Mrs. Heckler’s husband, was designated Village Clerk. Robert Willets served as Mayor until he retired in 1945. William W. Murray, Jr. succeeded him, until his resignation (due to ill health) in 1952. Raymond E. Dolar subsequently served as Mayor until 1966, when he relocated to Florida. William R. Fleischer succeeded him and became East Hills’ fourth Mayor in 1967. When East Hills was incorporated in 1931, the land area of East Hills was 98% farm and estate holdings, with 65 homes occupying the remaining 2%. Today, the percentage is reversed; with 98% of the land area occupied by homes, and less than 2% remains undeveloped. There are about 2,300 homes today in East Hills, and the population is approaching 7,200 people. That, in brief, is the story of East Hills — beginning with holdings by Indian tribes, to vast acreages for the wealthy few, to gracious living for many today.